Recently, I pulled out my full pvc home gym and though I’d coa bunch pull ups. Pull ups are a great way to develop upper body strength especially in your lats and biceps. Yet did you know that there were so many different types of them? 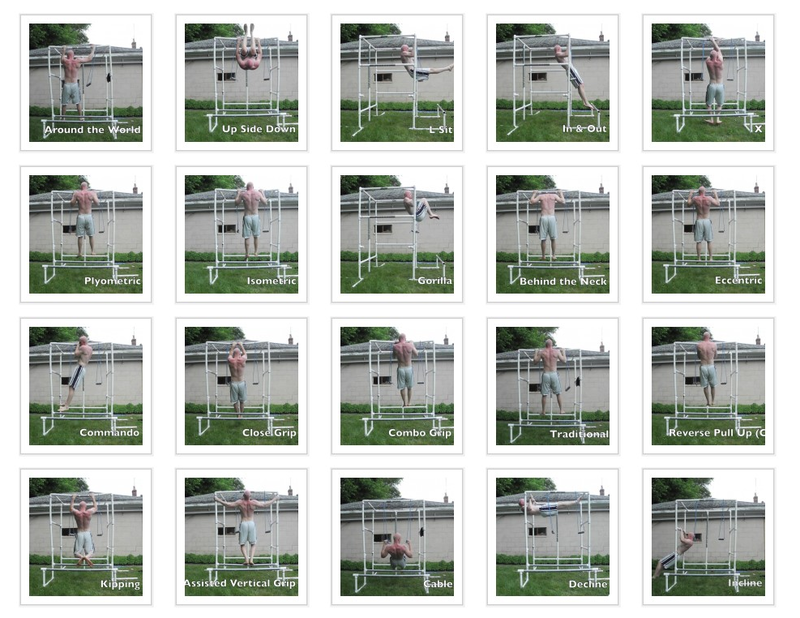 I created the video below as an example of all the different types of pull ups that you can do. Its great to vary them up because each one targets your biceps and back muscles in a slightly different way. 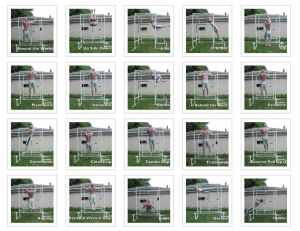 Below you will find 27 (actually 28 but I counted wrong in the video) different types of pull ups. There are actually quite a few more such as clap pull ups, pull ups where you adjust your hand position each time, etc. I’m still not 100% comfortable with doing extreme calisthenics on my PVC gym (for safety reasons) so I didn’t try them. 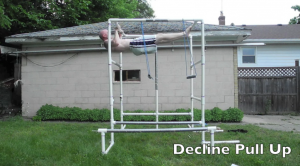 I am definitely looking to invest a bit of money on a new metal calisthenics gym but haven’t taken the time to do so. Below, you will find a full list of the exercises going from easiest to hardest just like in the video. 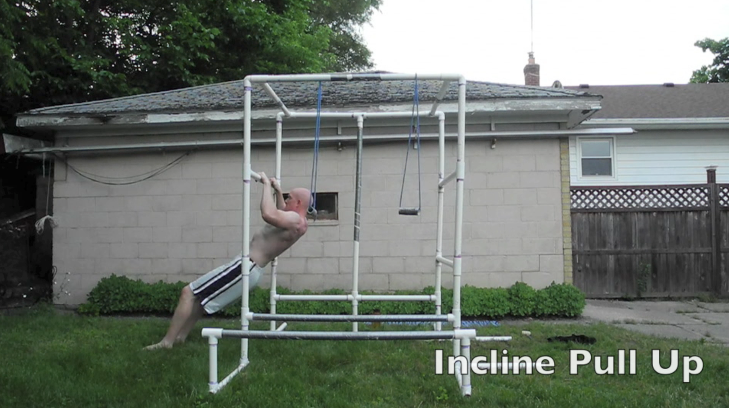 The incline pull up is a great beginner pull up to do that will help you work your way up to a full pull up. If you don’t have a pvc gym like I do you can just as easily use your normal pull up bar but put your feet on a chair. 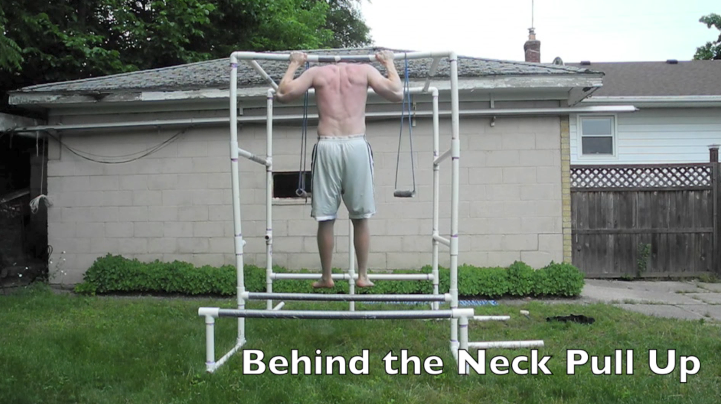 This is a great pull up to work the middle part of your back called your rhomboids. This exercise is much harder if you don’t have a pvc gym but is still doable if you have a drop ceiling and can put your feet on one of the wood panels in your ceiling. 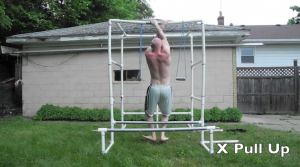 This is one of my favorite beginner pull up exercises because the instability of the cables make you recruit more of your stabilizer muscles. If you don’t have a pvc gym you can alway purchase some TRX Suspension Cables. I love this exercise! I have no idea how you would practice it without having a pvc gym but if you can find a way please let me know. The reason why I like it so much is because it strengthens your grip strength like no other pull up I know. The Kipping Pull Up requires you to use momentum in order to get your chin above the bar. 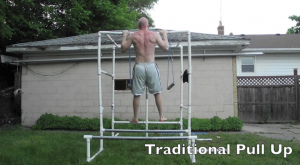 It is by no means as hard as a normal pull up however it is a great transition move to help you work up toward a standard pull up. 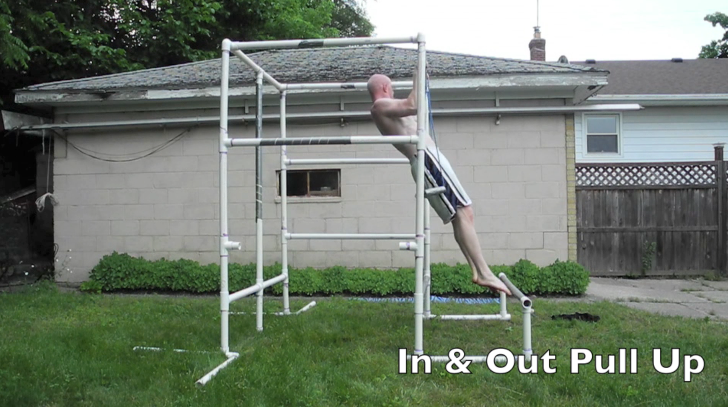 I also like to use this exercise after doing normal pull ups to help fatigue the muscle even further. I’m not sure if you normally call this a “pull up” per se but I did just for the sake of this video. Place your hands in a reverse position (palms facing you) and do the normal pull up. 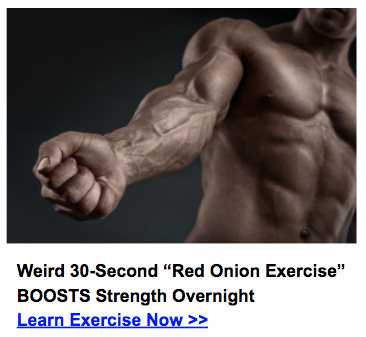 Its a great exercise for really honing in on your biceps. Oh yes, and we here we get to the classic pull up. 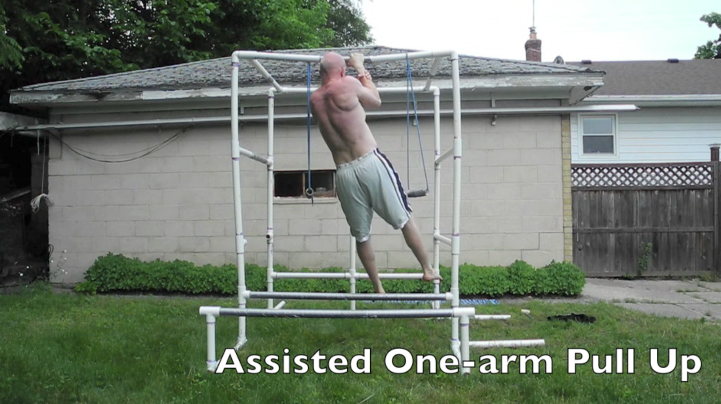 This is a tried-and-true exercise for developing both bicep and lat strength. If I could only choose one exercise to work my upper body this may easily be it. With this pull up you adjust your hand placement so that one is facing toward you and the other is facing away from you. If you do choose to do this style of pull up make sure you alternate your hand placement because the hand that is facing toward you will give you more of a bicep workout and the one that is facing away from you will give you more of a lat workout. This is a great exercise because it will target your lats in a slightly different way. Make sure that you keep your hands in as close as you can. I bet you will feel this pull up in your biceps as much as you do in the normal chin up exercise. It has been shown that when you put tension on the muscle in the eccentric part of the movement it tears muscle tissue more effectively. 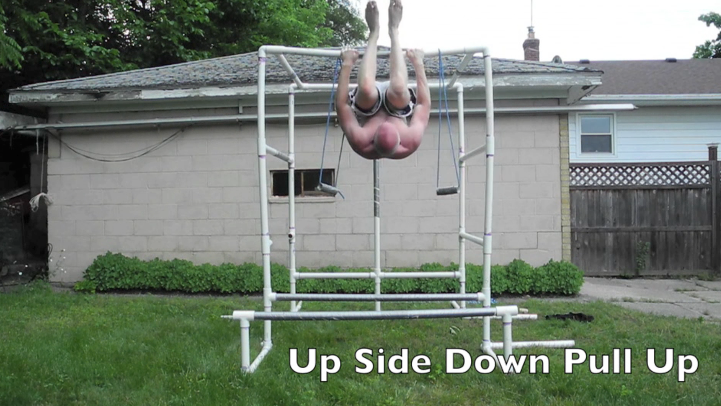 For this pull up first get up to the “up position” and then lower yourself down for a count of 5 or 10 seconds. The longer you are under “time under tension” the better. You definitely want to be careful on this one so that you don’t strain your neck. Its a great pull up to force yourself to target a different part of your lat muscle but I’m just giving you fair warning that if you do this one too much you may be feeling it in your neck. 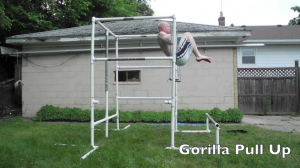 The Gorilla Pull Up is a great exercise that also engages your abs and hip flexors. When you pull up like normal simultaneously bring your knees up as high as you can. 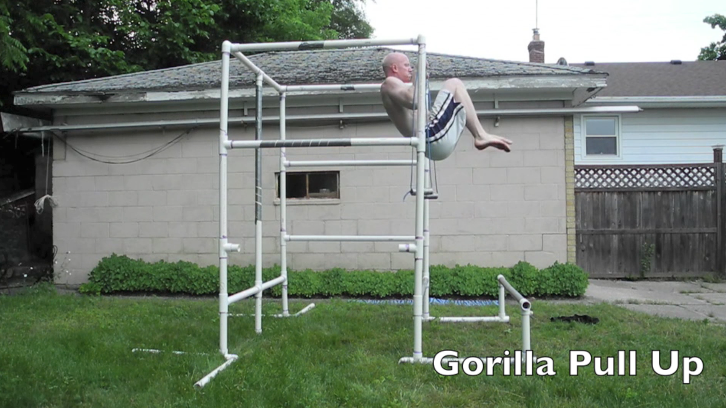 The reason it is called “gorilla” is because you kind of look like a gorilla as you pull up. 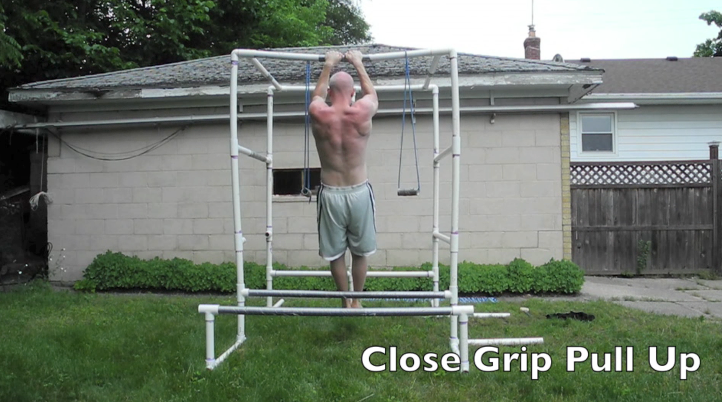 This type of pull up is a static hold. These are great because it really tests your strength ability. 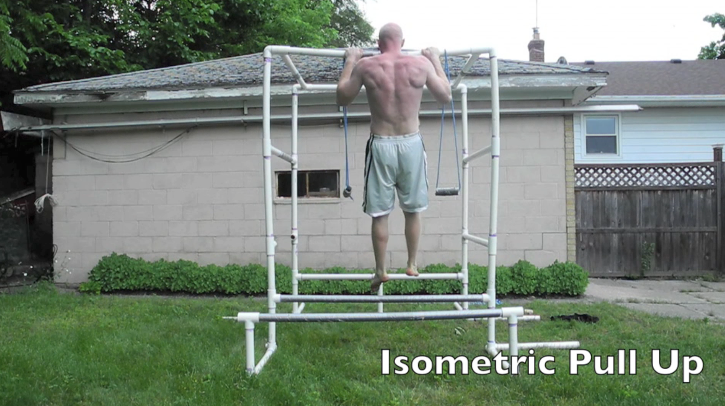 I like to do all of my normal pull ups and then finish off with an isometric hold as long as I can. Its a great way to push yourself to the max. Plyometrics are a great way to add explosive strength. During this type of exercise you strengthen the fast twitch muscle fibers. 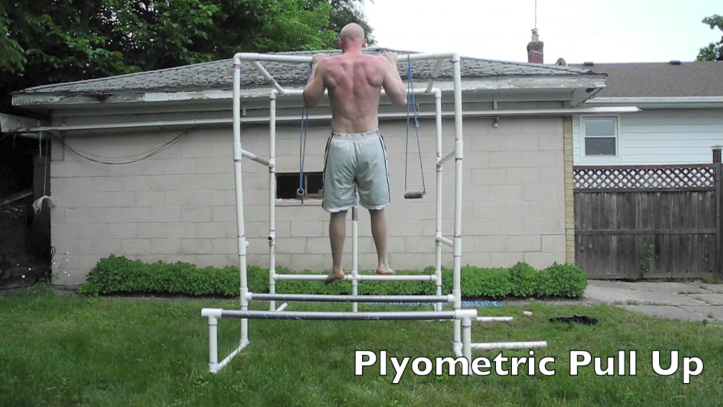 The plyometric pull up requires you to explode up as fast as you can and then lower back down. All the focus is on speed and explosion to get up as fast as you can. 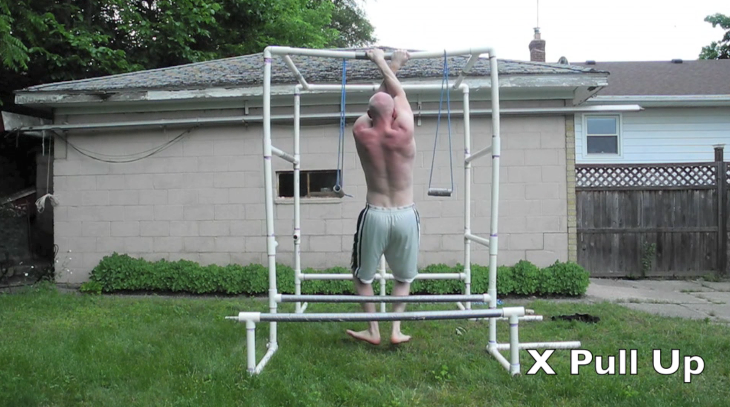 I’m not a huge fan of the X Pull Up but included it in the list because it is still fun to try. The goal is to try to stay as straight as you can the whole way up. Make sure that you switch sides so that you get an even workout on both sides. The In and Out Pull Up is a very challenging move because it requires great bicep strength as well as rhomboid strength. This is the muscle in the middle portion of your back. 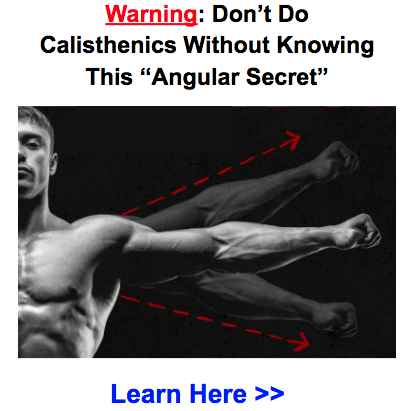 You will use both your rhomboids and your biceps to make the “in and out” motion for this movement. The L Sit Pull Up requires you to have a great amount of abdominal strength along with bicep and lat strength. As you pull up keep your legs as straight as you can. It will be a workout for your abs but also for your hip flexors too. Believe it or not but this pull up will work your biceps a ton. It simply targets them in a very unique way that you can get with other pull ups. If you have a normal pull up bar inside with a low ceiling it will be hard to do this pull up but its worth it to find a playground just to try it out. This might be my favorite pull up not just because it is really challenging but also because it combines a lot of transition movements. It requires you to have strength in lots of different parts of your upper body not just back and biceps. One of the reasons why I like the Archer Pull Up so much is because it works your biceps better than any other pull up. As you go out you are putting more stress on your biceps and as you come in you are putting less stress. 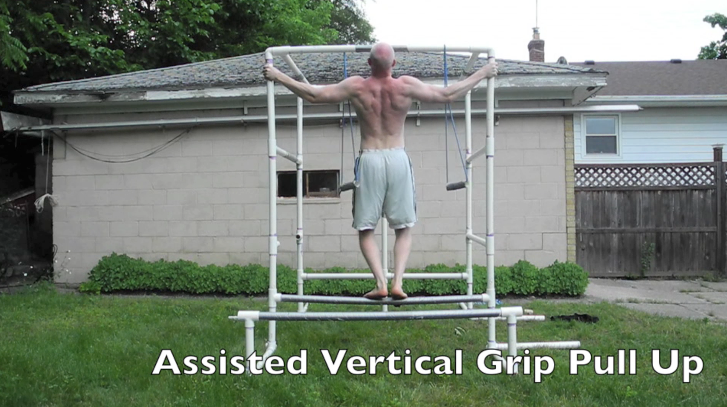 The Towel Pull Up is one of the best exercises for develop great grip strength. As you pull up and down you are forced to hold on tight in order not to fall. The uneven pull up is even harder than the archer pull up because you are forcing only one side of your body to do the majority of the workload. 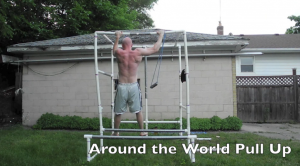 Use this pull up to achieve good muscular balance between each side of your body. This is absolutely one of the best pull ups to really target your lats. You’ll get huge lats if you do this all the time. The key to this exercise is you really have to find a way to get your hands spread out as far as you possibly can. You can see in the picture that I have my hands spread out really far. 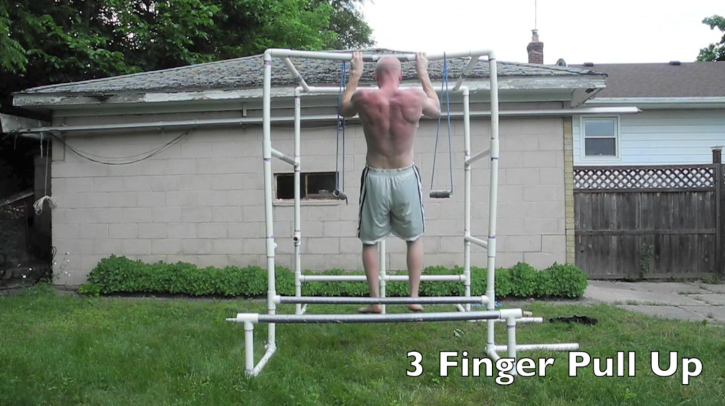 The finger pull up (this can be 3 finger, 2 finger or 1 finger) is really a method for developing strength in your fingers in addition to strength in your lats and biceps. Its easier to do if you have a narrow pull up bar. The PVC bar that I am working on is 1 1/2 inch pvc so its a bit harder. This is the transition pull up to do when you are working on your full one-arm pull up. I am still in the transition stage so can’t quite do my full one arm pull up yet. However, I will definitely be able to get it at some point! I’m not sure if I can officially call this a “pull up” but its still pretty fun anyway. 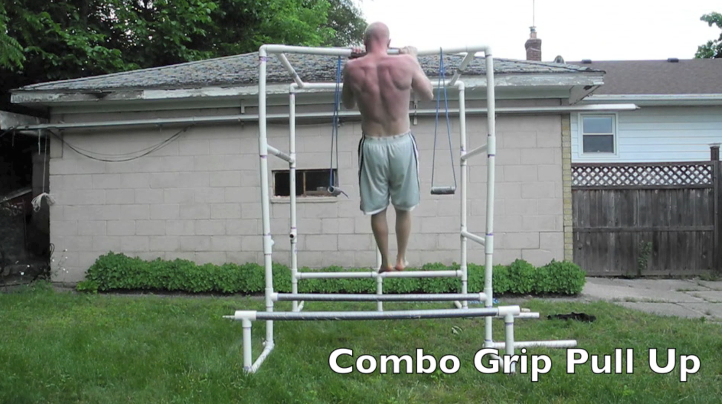 I can’t do my full muscle up yet but am using this movement as a transition move. 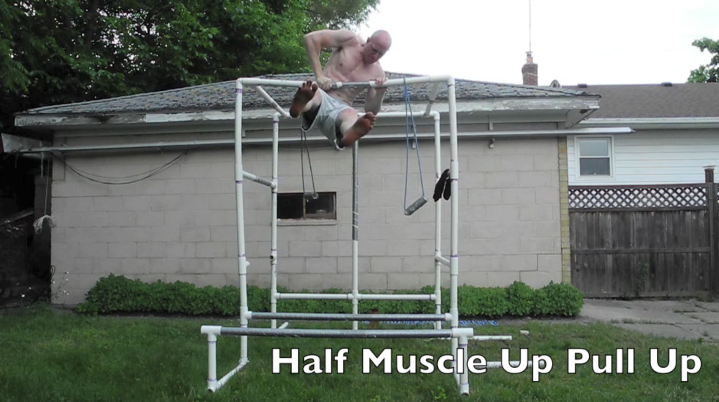 The goal is to be able to do it on both sides at least 10 times and then really hammer out your muscle ups. This pull up is super challenging. 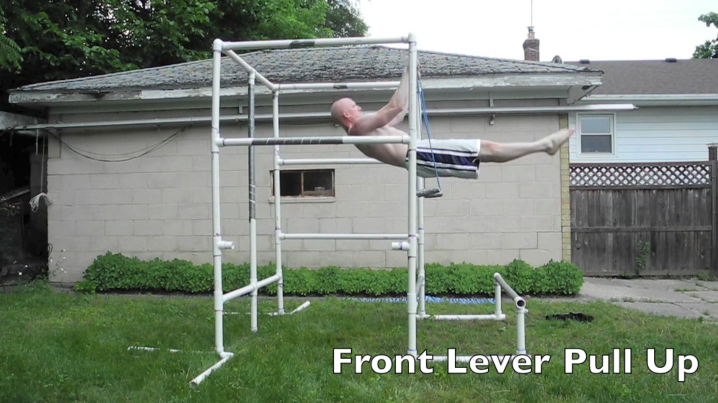 There are actually a couple different ways of doing a “front lever pull up” but this is just one of them. After your do a normal pull up, transition into a front lever. Then transition back. 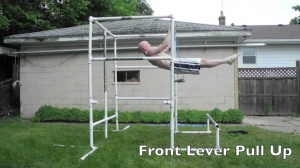 You could also go straight into the front lever and do pull ups while in it. I can’t do that yet but will hopefully be able to do it soon! Where there you have it folks! 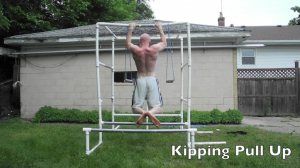 27 (or 28) different types of doing pull ups. Remember that no matter which pull up you do… do it to full fatigue otherwise you will not be tearing muscle tissue and not be getting much out of the movement. Great article bud … love my pull-ups! discovered your site at the beginning of the year when looking around for something to mix it up a bit. Have been long distance running for ever and do martial arts regularly but felt it was all getting a bit routine. Have just finished your 3 month programme and absolutely loved it. Have been mulling over what to do next and have been inspired by some of the guests you’ve interviewed, particularly those utilising bars. The timing of this post today is amazing as it gives me some great ideas for designing my own 3 month programme using bar work for upper body. I’m going to mix up my lower and core with many of the exercises I’ve been using recently, however, if you’ve got any ideas for incorporating bar work to focus on core that’d be great. I was going to add leg raises, oblique raises, etc but any other ideas would be great. Congrats on finishing the 3 month program! Way to go! I’m glad you enjoyed this article. 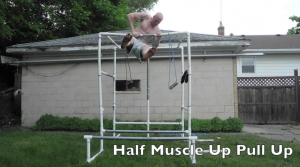 There are a ton of different types of pull ups and doing leg raises, etc. is a great way to engage your abs. I would also recommend doing ground stuff for a well-rounded attack for abdominal strength. LOL! Thanks Paco! 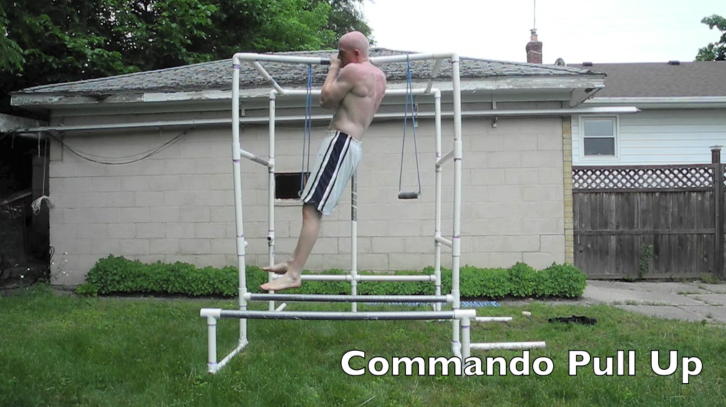 Eventually I want to build a metal version of this pvc gym. I would like to say thank you for all the free information..which id a real blessing.My question is do you teach or believe that isometric s or dynamic tension can build muscle or have any benefit. Thank you. Thanks for the comment. Here’s an article where I go more in depth into dynamic tension as well as isometrics. it was pure joy to do many of this movements. Do you know that in Opera the frame with post content is empty? I have to switch to Firefox anytime I want to visit this site. I’m glad you liked the pull ups! a great deal of money but you also get to spend more time with your cherished ones. Nevertheless, it’s essential to possess all the most appropriate training equipment for your home gym or else your are not going to see marvelous results. These are great tips. I agree that home gyms help you save time. No need to drive anywhere, wait for equipment, etc. like with a commercial gym. thanks for sharing your videos. 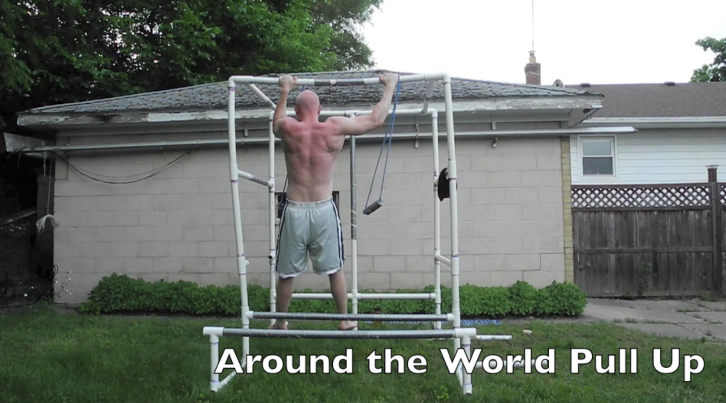 I am looking to make a homemade gym, using steel pipes and kee klamps. 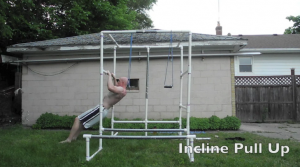 Considering that now you have a long experience on the PVC gym, I wish to have your kind opinion: should I follow the same dimensions and shape even for a metal gym? Or do you think something could be changed/improved on the light of the different material? Thanks in advance and greetings from Italy! Awesome idea! I was thinking of doing the same. I can’t think of any ways to change it. Have you priced out pieces yet? 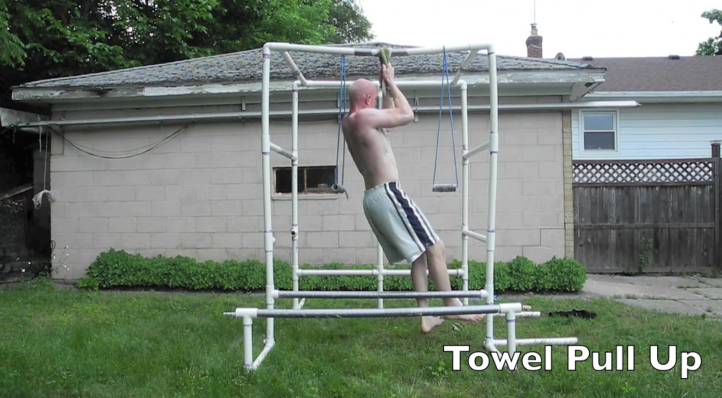 My PVC gym ran about $150 so I imagine a metal version will be a bit more. Thanks Todd for your kind reply. Actually now I am collecting some bids. I was thinking to make parallets 60 cm high, instead of 1 foot, and the whole structure a little bit higher, in order to make more confortable working with rings, but I am still evaluating the modifications! Keep in touch! Awesome buddy. Thats a great idea.